Which models of Acutime GPS antenna are compatible with the STR-100? The STR-100 and STR-100/IRIG-B have been tested with the Trimble Acutime GG GPS antenna, as well as its predecessors, Acutime Gold and Acutime 2000. The latest version, Acutime 360, does not work plug and play like its predecessor and requires programming if purchased directly from Trimble. To perform this programming, please see the link to the instructions below. Can the CNV-100 be used to connect a 4-wire master to a 2-wire device? What power supply is recommended for the CNV-100? The CNV-100 is UL-listed for operation with a 24Vdc Class II isolated power supply. For best results, Cyber Sciences recommends using a 24Vdc Class II isolated power supply, rated 15 watts, dedicated to the CNV-100. What baud rates are supported by the CNV-100? In general, the CNV-100 can be used with any ASCII-based protocol that adheres to the RS-485 standard at baud rates of 9600, 19.2k or 38.4k bps. No setup is required. How can I use the STR-100 to time-sync Sepam relays from Schneider Electric? The STR-100 can be configured to output 1 sync pulse every 10 seconds (1per10) to give Sepam relays from Schneider Electric a precise on-time mark. This is output over STR-100 channel 2 to up to 16 Sepam relays, types 20/40/80. Sepam logic input I21 (I103 for Series 80) must be configured as time-sync input using Sepam setup software. How can I use the STR-100 to time-sync Power Xpert meters from Eaton? The STR-100 outputs standard DCF77 time protocol to sync Power Xpert meters (PXM 4000/6000/8000) from Eaton. Each STR-100 can support up to 32 PowerXpert meters, 16 meters per STR-100 channel. PowerXpert meters require an interposing relay to isolate the meter from the 24Vdc DCF77 signal as shown below. To accept the 24Vdc DCF77 signal, the Power Xpert meter must be equipped with a PXIO-B card. One of the inputs on this card must then be configured to accept DCF77 as time source. Note: PXM firmware version 13.3.5.4 or later is recommended. Contact Eaton for more details. Why is the PowerLogic circuit monitor clock off by exactly 100 ms? The PowerLogic Circuit Monitor (series CM4000) may show a time value that is exactly off by 100ms if the polarity of the DCF77 signal is reversed, thus causing the meter to sync to the trailing edge of the pulse not the leading edge. Why is the PowerLogic circuit monitor not getting the correct time, even though the DCF77 signal is valid? The PowerLogic Circuit Monitor (series CM4000) requires the correct year to be set prior to accepting a time-sync input. If the circuit monitor is set to a value for present year that differs from that sent in the output DCF77 frame, the circuit monitor does not accept the time synchronization. Verify the correct year is stored in the circuit monitor. If the STR-100 DCF77 LED blinks once per second, then the problem is probably a result of circuit monitor setup or wiring error. What causes the STR-100 to stop generating DCF77 output? There is a watchdog timer that goes off when the GPS time-source input signal is lost for five seconds or more. This could happen, for example, when the antenna does not have a fix on at least one satellite. Can I connect twisted pair cable instead of coax to the BNC connector on the STR-100? Yes. Pomona makes a BNC-to-screw-terminals adapter that is compatible with the STR. The Pomona part number is 1296 and can be purchased from many electronics distributors. Do I need to change the Acutime antenna self-survey parameters? You would configure them if you want the antenna to come up quickly after a power loss. The recommended value of 600 will allow the antenna to synchronize about three to four times faster than the factory default of 2000. Setting the self-survey parameters instructs the antenna to store its position in its non-volatile (EEPROM) memory. On power-up, it will use the stored position instead of doing a lengthy self-survey. Can IRIG-B and Acutime GPS antenna sources both be connected to the STR-100? Yes. The STR first checks for a valid signal from the Acutime antenna. When both sources are connected and functioning, the antenna will be selected when the STR starts up. If the antenna is not outputting its PPS (pulse per second) signal when the STR is powered up or reset, then the IRIG-B source would be selected. Note: This applies only to the base model, STR-100. The STR-100-IRIG-B model accepts time-source input from a Trimble Acutime antenna, NOT IRIG-B. Do I need to set the local time offset and the Daylight Saving Time table in the STR-100? No. These adjustments are optional. Without these adjustments, the STR-100 will simply output date/time in terms of Coordinated Universal Time (UTC). In fact, Cyber Sciences recommends that most time-stamps be recorded in UTC and adjusted to local time (if desired) at the point of consumption, such as the HMI. When entering values into the DST table, use Standard Time values for both entries. For example, if Daylight Saving Time starts at 2:00 a.m. US CST and ends at 2:00 a.m. CDT, then the start time would be entered as 2:00:00 and the stop time as 1:00:00. Does the STR-100 accept Modulated IRIG-B input or Unmodulated IRIG-B input? 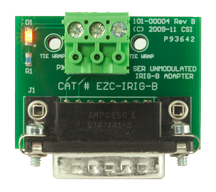 The STR-100 accepts modulated IRIG-B (via side BNC connector) or GPS input from a Trimble Acutime GG smart antenna or equivalent. Modulated IRIG-B is also known as Amplitude Modulated IRIG-B (Codes B120 to B123). What are the HTS and ECCN export codes for CyTime SER-3200/2408? Harmonized Tariff System (HTS) Code: A Commodity code recognized globally by US and foreign customs and trade authorities that identifies the commodity type and group. Customs duties and tariffs are based on these codes. ECCN – Export Control Classification – is a five-character reference number which helps determine 1) Level of control on parts 2) Countries allowed to receive the exported part 3) Licensing and reporting requirements. How can I clear the event log on an SER-3200/2408? You can clear the SER events log using the Modbus “Command Interface” described in the Reference Guide. Briefly, this requires writing a value of 4210 to register 408001 and a value of 1 to register 408002. [If two separate Modbus writes, FIRST write the parameter value (1) to 408002, THEN write the command code (4210) to 408001.] This will clear all events, counters and EPSS data logs and cause the SER to restart. Note: This action will NOT affect any configuration or customized labels created during setup. In addition, the unique sequence numbers will NOT be cleared. Why does the SER show an incorrect serial number (9999) on the LCD screen and Diagnostics web page? This is an indication that an older unit was updated to a newer firmware release, but the older version did not report serial number at the time of its manufacture. This feature was added in a subsequent firmware release. For units with date of manufacture (DOM) of 05-2016 or later (firmware version v.2.11 or later), the serial number of a CyTime SER-3200/2408 Event Recorder is reported on its Diagnostics web page and also via Modbus registers 409024-409025 (as well as its local LCD display). Prior to this, the only way to see a unit’s serial number was to inspect its side label. Updating the firmware of older units to v2.11 or later makes provisions for reporting the serial number electronically; however, to show the correct serial number (instead of 9999), an internal file must be edited. The serial number is recorded in the unit’s device data file called _DEVDATA.XML, stored on the SD card. To enable an SER manufactured prior to May 2016 to report its serial number electronically, first update firmware to the latest version, following the published instructions. This will update the structure of the _DEVDATA.XML file to include a space for serial number, but a default of 9999 will be used. The file may then be copied via FTP, edited to include the correct serial number (as it appears on the side label), then the file sent back to the SER. You should then see the correct serial number on the front LCD and Diagnostics web page, and it should also be accessible over Ethernet by reading Modbus registers 409024-409025. Can I access the SER’s serial number via its web interface? Yes. 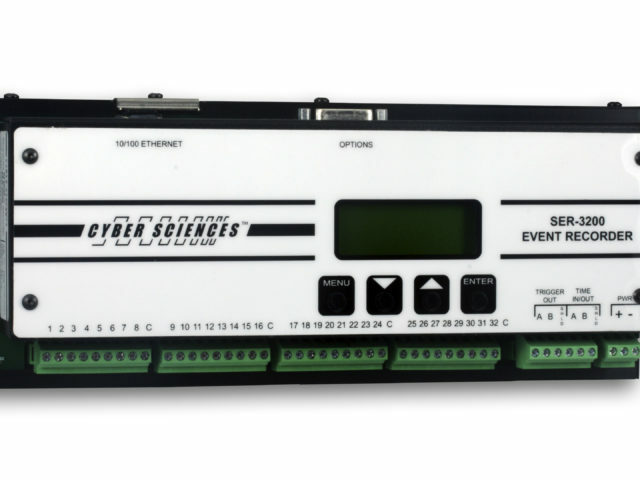 For units with the date of manufacture (DOM) of 05-2016 or later (firmware version v.2.11 or later), the serial number of a CyTime SER-3200/2408 Event Recorder is reported on its Diagnostics web page and also via Modbus registers 409024-409025 (as well as its local LCD display). 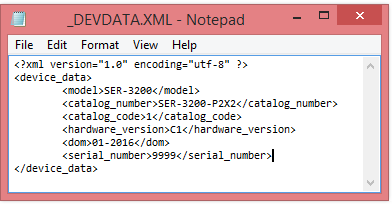 The serial number is also recorded in the unit’s device data file called _DEVDATA.XML, stored on the SD card (see image below). To enable an SER manufactured prior to May 2016 to report its serial number electronically, first update the firmware to the latest version, following the published instructions. This will update the structure of the _DEVDATA.XML file to include a space for the serial number, but a default of 9999 will be used. The file may then be copied via FTP, edited to include the correct serial number (as it appears on the side label), then the file sent back to the SER. You should then see the correct serial number on the front LCD and Diagnostics web page, and it should also be accessible over Ethernet by reading Modbus registers 409024-409025. How can I update the CyTime SER to the latest firmware? The CyTime SER-3200/2408 (all models) can benefit from a firmware update. The update can be performed over a network, and typically takes about 10 minutes. The latest firmware is available for free from the downloads page (Support > Downloads). Also found on the Downloads page are instructions for updating firmware and detailed release notes describing the changes in each release. Note: updating firmware does not affect any user settings. Why does the CyTime SER show the Time Quality as 2: Poor (> 50 ms) even with a valid NTP time source? This descriptive text (2:Poor) was used in firmware versions v2.11 and earlier, even for a valid NTP time source. The accuracy of NTP time sync depends on external factors; therefore, the SER uses only two states for NTP Time Quality: Time Quality = 2:OK (NTP) if locked to a server, or 3: Bad (no sync) if no NTP is found. The first two states, 0:Good (< 1ms) and 1:Fair (< 50 ms) apply only to PTP, IRIG-B or DCF77 time sources, whose quality is known to exceed 1 ms accuracy. Note: in firmware version 2.12, the terminology for NTP lock was changed to 2:OK (NTP). Earlier versions do not differentiate for NTP time source, and so they report 2: Poor (> 50 ms), even for the locked state. This condition is purely cosmetic, but if desired, updating firmware to the latest version will avoid the misleading descriptive text. Why does the CyTime SER show the year as 2000 when it has a valid IRIG-B time source? CyTime SER-3200/2408 Event Recorders require the complete IRIG-B time code, including the year. The current IRIG-B standard (2004) includes the year as part of the IRIG-B time code, but prior to this date, the year had to be included in some other way. To solve this issue, the IEEE-1344 standard prescribed a method to include the year as part of the optional control bits in the IRIG-B standard, which came to be known as IEEE-1344 extensions. Do I need an EZC connector with my SER-3200/2408? Time-sync via IRIG-B: you need one EZC-IRIG-B connector per SER. Time-sync via DCF77: you need one EZC-DCF77 connector per SER. The Cyber Sciences Tech Note (TN-101) on System Architectures provides more details and presents several time-sync examples. Where can I find details on the Modbus TCP interface for CyTime SER-3200/2408? The Modbus TCP interface for CyTime Sequence of Events Recorders, models SER-3200 and SER-2408, is described in detail in the CyTime SER Reference Guide, doc no IB-SER-01. The Reference Guide includes the Modbus function codes supported, Modbus register map, TCP/UDP ports used, and technical description of the SER event log and EPSS data logs per group. In addition, the SER Command Interface allows selected actions to be performed via Modbus TCP, including clearing the event log, resetting counters or controlling relay outputs (model SER-2408 only). What is the difference between models SER-3200 and SER-2408? Both CyTime Sequence of Events Recorders, models SER-3200 and SER-2408, share a common feature set. Model SER-3200 has 32 high-speed digital inputs for event recording. Model SER-2408 has 24 inputs and 8 relay outputs. Where can I find Cyber Sciences white papers (Tech Notes)? All Cyber Sciences’ white papers (called Tech Notes) are included in the Technical Library, accessible from the main menu under Support. Popular topics include SER system architectures, GPS time-sync protocols such as IRIG-B and DCF77, SER device selection guidelines and RS-485 2-wire/4-wire networks.